"Here!" Minho exclaimed, pulling Taemin inside the cosy building. The restaurant simply glowed - bright lanterns hung from the ceiling, illuminating the walls which were decorated in detailed and colourful paintings. "The best pizza!" Taemin grinned, admiring the room. "This is... great. Thank you for bringing me here." Minho bowed his head, wrapping his arm around Taemin&apos;s shoulders and walking him through to an empty table. "I booked it before we came here," Minho explained as he saw Taemin looking around for a waiter. "I knew you&apos;d like it." Taemin laughed, thanking his boyfriend once more. "What do you recommend?" he asked as he scanned the menu which was placed neatly on the clothed table. Soon after, Minho ordered them a pizza to share, knowing that neither of them would be able to eat a whole one on their own. In between the ordering and the eating, they spoke of things that Taemin didn&apos;t think truly mattered - just idle gossip. He was only praying that Minho wouldn&apos;t bring up something awkward while they were in London. Thirty minutes later, Taemin was becoming increasingly hungrier having not eaten anything for breakfast. "It&apos;s just like I remembered!" Minho exclaimed, grinning as the pizza was placed on the table. Taemin clapped his hands and thanked the waiter before he spun on his heel and walked over to another customer. "You&apos;re glad I didn&apos;t let you order your own pizza?" Minho laughed, and Taemin nodded sheepishly. "Your eyes are bigger than your belly." "Shut up!" Taemin replied, stretching his arm across the table to elbow Minho. He was successfully ignoring Minho, for about a minute to be precise, until he took the first bite of his pizza. "This is so great - how can something so simple taste this good?" Taemin asked in awe and Minho chuckled. "Probably because the ingredients are dough, tomato paste and cheese; just pure fat and grease," he teased again and Taemin huffed, proceeding to ignore Minho and he scoffed down the rest of his pizza. "Do you want any dessert?" Minho asked tentatively after they had finished their pizza. "No, after all, all they serve is &apos;pure fat and grease&apos; here." Taemin retorted and Minho sighed, rolling his eyes and placing his hand on Taemin&apos;s.
"It was a joke, maknae. Now, do you want dessert or not? After all, I am the one paying," Minho said and tapped Taemin&apos;s nose playfully. "Can we share ice cream?" Taemin asked timidly, his mood suddenly turning to shy, wondering if he should more conscious about his eating habits. "Sure," Minho replied and they spent the rest of their time at the restaurant eating ice cream and giggling over stories about their band. "And here we are: the National History Museum!" Jonghyun practically shouted as they entered the museum. "Yah, Jonghyun, be quieter. You&apos;ve never even been here before; I&apos;m the one who has to show you around, so you better respect the rules and be quiet," Key sassed and Jonghyun humphed in defeat. "Fine," he huffed, "where do we go first?" "Let&apos;s go to the &apos;Secret Cities of the Sea&apos; exhibition!" Key suggested and Jonghyun nodded, happy to oblige. He grabbed Key&apos;s hand and linked together their fingers, not caring what anyone else thought about it. "Whoa, look at all this pretty coral," Key commented once they arrived at the exhibition, enthralled by all the contrasting colours and mesmerising fish. "It&apos;s all so pretty. Just like you," Jonghyun stated, hand still clasped with Key&apos;s.
"You&apos;re such a cheeseball." Key rolled his eyes and Jonghyun chuckled, leaning in and giving him a quick kiss in front of the aquarium. "Excuse me, can you not do that?" They heard a man ask, interrupting their kiss. "Do what?" Key replied in English - he was fluent, but Jonghyun could only understand broken bits of English and he could put together certain sentences - placing his hands on his hips. "Kiss... him, in public. There are kids here and I&apos;m sure they or their parents wouldn&apos;t want to be corrupted like this," the man said calmly, which irritated the couple even more. "Corrupt them? Seriously? We were just kissing, it&apos;s not like we were doing anything worse," Key said, not going into detail just in case the little boy heard. "Not yet," he whispered into Jonghyun&apos;s ear, switching back to Korean so that no one else could understand. Jonghyun blushed, his ears turning a darker shade of red. "Yes, but I don&apos;t need my son to see two men kissing; it&apos;s wrong." The man furrowed his eyebrows, slowly becoming even more frustrated as he saw the two boys giggling together. Key scoffed, raising his own eyebrow. "The only thing that&apos;s wrong here is how you can&apos;t understand the true meaning of love. Love knows no bounds or gender, you&apos;re just too blind to see that there is nothing wrong with this." Key explained, gesturing between himself and his boyfriend. Jonghyun just stood with a puzzled expression on his face, obviously not understanding anything Key was saying, but he nodded nonetheless to back up his boyfriend. "Now if you&apos;ll excuse me, we would like to get back to the exhibition without any interruptions. Thank you," Key finished angrily and he turned around, dragging Jonghyun by his hand which was still gripped in his own, and leaving the man stunned. "Wow, even though I hardly understood any of that, you were amazing," Jonghyun laughed, trying to make sense of the situation. Key only chuckled, bringing him in for another kiss, but Key mentally cursed when they were interrupted again by another voice. "Look, I&apos;m sorry but if you&apos;re also going to lecture us about how being gay is &apos;wrong&apos;, I would like to kindly ask you to leave," Key badgered as he looked at the old lady before him. "No! No, that&apos;s the opposite of what I was going to do, but I&apos;m sorry I gave you that impression." The old lady apologized and Key immediately apologized back, feeling guilty at his outburst. "I&apos;m sorry, ma&apos;am, I didn&apos;t indend to be so rude. We&apos;ve just had a rough day, that&apos;s all," Key explained and the lady nodded that she understood. "I know, don&apos;t worry. I just wanted to say that it&apos;s truly lovely seeing such a young couple stand up for love. I&apos;ve seen lots of couples be diminished and completely crushed by rude, unnecessary comments, so I&apos;m glad to see you two stand up for it," the old lady concluded and Key and Jonghyun nodded thankfully. "She seemed nice." 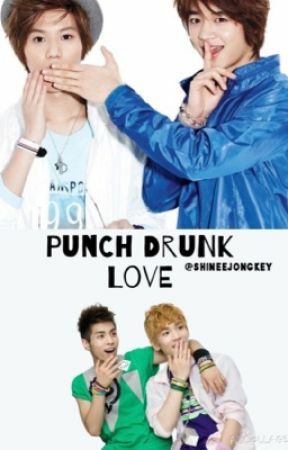 Jonghyun said and Key laughed in agreement. "C&apos;mon, let&apos;s go to the butterfly exhibition. I want to see the caterpillars!" Key cheered and Jonghyun nodded, leaning over to finish their kiss before walking off to see the butterflies.